If you are like me, you hate hearing the pitter patter of your 85lb dog walking/running across the hardwood floors every morning. On the other hand, that sound could be used as a warning for the soon to be wet slobbery kiss in your face. 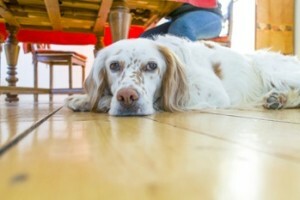 Many homeowners love the idea of wood flooring because it is easy to clean up messes; however, if you have any furry pets, you know that it can be more difficult to maintain, especially when you have the fear of toenails scratching the floor. If you are remodeling, bamboo is a route to consider since it is stain-resistant, but switching up the feel and going with ceramic tile makes the room more scratchproof. Try to stay away from porous materials, because they aren’t as pet friendly as other surfaces. Wall-to-wall carpet is also something to stay away from with pets. If carpet is a must, avoid continuous loop carpet since toenails can catch a single woven loop and unravel the carpet. For more great ideas and do’s and don’ts, check out this article from HGTV on tips for a pet-friendly home.